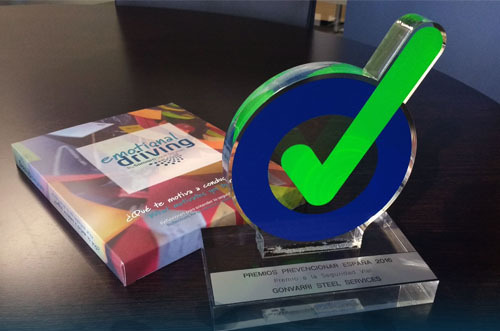 Emotional Driving has received Prevencionar Award as best Project on road safety. According to the jury, the prize is awarded due to the “perfect planning and implementation of ‘Emotional Driving’ project, as well as for its satisfactory results”. Gonvarri won the prize against other important competitors as Johnson & Johnson, Alsa, Truckdeal and Egarsat. Altogether, a sum of 349 applications were presented to the first edition of Prevencionar Awards. With this one, there are 12 international awards already won in different categories, as Internal Communications, Corporate Social Responsibility and, this time, Road Safety. The award ceremony took place last Tuesday at Ramón Areces Foundation, that gathered about 400 people from different areas and from Occupational Risks and Human Resources departments.